Servings 16 people or more! 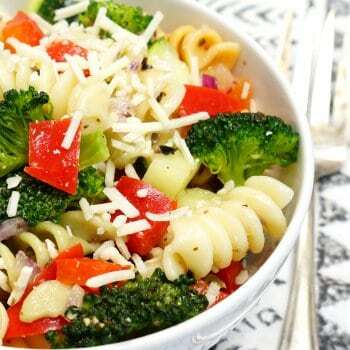 Prepare the vegetable and mix together with parmesan cheese. Cook the pasta until al dente according to the package directions. Drain and add to vegetable and cheese mixture. Add 3/4 of a bottle of Italian dressing and mix well. Chill for at least 6-8 hours (I prefer to chill overnight). Before serving, add the remaining 1/4 bottle of dressing and top with a bit more parmesan cheese for garnish.